Look for all-inclusive packages when you plan to spend most of your vacation at the resort, enjoying its many facilities, activities and dining. There are many types of offers to choose from, including honeymoon, couples' and family specials. Many beach resorts around the world offer pricing that includes all meals, watersports, fitness classes, nightly accommodations and many on-site activities. Get away to a remote island in Australia, plan a family vacation in British Columbia, escape to Fiji or enjoy a trip in Arizona with these great packages. 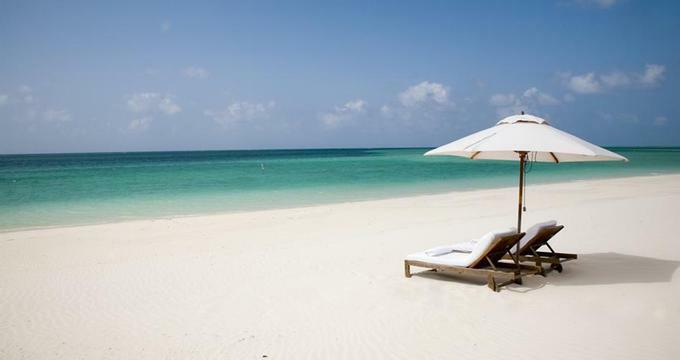 You may also like: 25 All Inclusive Beach Vacations. 2 Fly Free Special on the Grand Bahama: Old Bahama Bay is offering 2 free plane tickets from Nassau to Freeport on Grand Bahama Island to vacationers who book a 4-night air-inclusive package. Ask for the "2 Fly Free" special. You may also like the "Honeymoon & Romance offer" which features 4 nights in a luxury junior suite, daily breakfast for 2, one private dinner for 2 (served on the beach or in your suite), an in-room couples massage, bottle of sparkling wine, airport transfers and all taxes, service charges and resort fees. Rates start at $1,633 in an oceanview room. Breakfast, Lunch and Dinner from $2,410 for 3 Nights: Parrot Cay in the Turks and Caicos, British West Indies is offering several great luxury specials for couples. "Romantic Escape" requires a 3-night minimum and a 7-night maximum. Rates start at US $2,410 per couple in a Terrace Room and includes: 3 nights', breakfast, lunch and dinner, afternoon tea, couples' massage, many activities (yoga, Pilates, water sports). Couples expecting a baby can get away with the "Blissful Babymoon" offer starting at US $2,905 for double occupancy in a Terrace Room for 3 nights. The package includes: 3 nights, breakfast, lunch and dinner, massages, private pre-natal yoga and complimentary scheduled activities. If two couples want to vacation together, there is a package for them as well, although this one does not include all meals. "Couples Getaway" starts at US $1,815 per person for three nights and includes: couples' massage, dinner, and a choice of activity such as sunset cruise, picnic, snorkeling or a private group yoga session. Junior Suite near the Water from $412 in the Dominican Republic: Rates at the beachfront Paradisus Palma Real Resort in the Dominican Republic are all inclusive. Starting at $412 USD per night for a Garden View Junior Suite, the rate includes all meals, 24 hour room service, an Extensive international wine list, access to the Fully equipped gym, and Free high speed WiFi internet in the public areas and rooms. Vacationers have access to many activities and entertainment, such as sushi making, wine tasting, Dominican art workshop, candle making, painting classes, merengue and salsa dance classes. There is volleyball and football, Non-motorized water sports and Live evening entertainment. There are 9 bars serving trendy Caribbean cocktails, and 11 restaurants serving a variety of flavors. Facilities include a main pool, 6 hydromassage tubs, disco, 5 tennis courts, Spa and golf. Bahamas from $479: With rates starting at $479, Melia Nassau Beach is a great getaway for families and couples. Use promo code LAPKG1 to get the special with the following amenities: Daily breakfast at Bimini Market, Daily lunch at Bimini Market or Dolphin Grill, Daily dinner at Bimini Market or Amici A' Trattoria, All beverages, alcoholic and non-alcoholic, Non-motorized water sports presented by Aquamarine Water Sports, Complimentary access to the fitness center, Local phone calls, Internet access (including Link at Sheraton), In-room coffee/tea, all taxes and resort fees. Beach Villa, Activities and All Meals in Fiji: Perfect for couples and honeymooners who want to leave their worries behind, Turtle Island in Fiji offers all-inclusive packages that include all meals and most activities. The nightly rate includes all meals, snacks and drinks, any time you wish, "Bure Mama" butler service, sunset cruise, picnics, entertainment, fishing, Lomilomi massage, sailing, scuba and more. Guests are accommodated in a beachfront 1,300 square foot villa with a spacious veranda, Jacuzzi and a spacious living room. 3 Nights for the Price of 2 in Fiji: Plan a quick romantic escape to Namale resort in Fiji, featured on the popular TV show the Bachelorette. The resort is offering a 3 nights for the price of 2 special and a $100 FJD resort credit which you can use on soothing spa treatments. If you want to stay longer, the resort is also offering seven nights for the price of six, and five nights for the price of four. Click here for more great couples deals in Fiji. Scuba Dive on the Great Barrier Reef, Plus a Free Night: Lizard Island is offering a "Free Nights And Free Dives" special that's ideal for an active couple celebrating their honeymoon, anniversary or a special occasion. The package includes 5 nights accommodations for the price of 4, 6 dives for the price of 3, All gourmet meals and selected fine Australian and New Zealand wines, beer, spirits and champagne. 3 Nights in Puerto Vallarta: Relax and rejuvenate without having to worry about adding the cost of dining and activities. The Westin Resort & Spa, Puerto Vallarta is offering an all inclusive package which requires a 3 night minimum stay and includes many activities and all day dining. The offer includes: All-day dinning, Kids under 4 eat for free and kids 5-12 have a 50% off, tennis, Access to the fitness center, Free in-room Internet and Free access to Kids Club. If you don't need the all inclusive package, the resort offers several other specials as well. Ask about the Westin Family offer which includes: Kids under 12 eat free, free access to the Westin Kids Club for two. Ask about the "Soothe Package" which includes: spa amenity, Spa Credit, breakfast and a late checkout if available. Arizona: Arizona Biltmore Resort is offering a special from $379 per night which includes: Classic Accommodations, Breakfast for two, Lunch for two, Dinner for two, 30% off Spa a la carte services, Free Self Parking, and Resort Charge included. Save Up to 45% in Mazatlan: Pueblo Bonito Mazatlan Resort is a beautiful all inclusive getaway in Mazatlan, Mexico. The resort is offering up to 45% off on certain dates. Guests can also save up to 50% on hotel and air packages. Travelers enjoy manicured gardens, all-suite accommodations, 11 restaurants and bars. Services included in the daily rate are: a suite, beach, complimentary shuttle, fitness, tours and cooking classes. All-inclusive Acapulco from 2,199 pesos (MXN) per Person, per Night: The Fairmont Pierre Marques is offering several great specials that let you relax on the beach and visit the spa. "Yes! All Inclusive in Acapulco" offer starts at $2,199 pesos (MXN) per person, per night and includes: Breakfast buffet, Lunch buffet, Dinner buffet, Snacks by the pool or beach, Open Bar, Children's activities, free Valet Parking, 1 Hour of Tennis, Free internet, Gratuities and taxes included. The resort offers special Theme Nights during certain times of the year. The "Special Premium Golf Experience" starts at $199 USD per person per night and includes: Accommodation in Deluxe Ocean View room category, per night, based on double occupancy, with breakfast and taxes included. $50 USD food and beverage credit per room, per night and 1 Round of Golf per room per night. 18 holes at either the Acapulco Princess Golf Course or Turtle Dunes Country Club. Ask about the "Special Suite Offer 4th Night Free & $100 Food & Beverage Credit" offer which starts at $3,589 pesos (MXN) inclusive of taxes, per night and includes: Four night's accommodation in a luxurious suite, Breakfast for two adults, Complimentary fourth night with breakfast included and a $100 Food & Beverage credit (one per room per stay). East Maui from $825 with all Meals and Activities: Travaasa Hana on the secluded East Coast of Maui, Hawaii, offers all-inclusive rates. In addition to accommodations and 3 meals daily (using local, organic ingredients), guests receive unlimited access numerous programs & activities, welcome amenity and a $125 resort credit per person per day. Use the resort credit to get treatments at the beautiful Hawaiian spa which has a large outdoor relaxation area and first class facilities surrounded by the beauty of the Hawaiian islands. From $825 per night. The hotel also offers a la carte rates starting at $375 per night. Click here for more about Hawaii. Inclusive Hawaii Yoga Retreat from $1,431 for 3 Nights: Hawaii Island Retreat at Ahu Pohaku Ho'omaluhia is an eco-friendly getaway on the Big Island of Hawaii, offering a number of offers. Signature Spa Package let's you choose from a 3-, 5- or a 7-night stay which includes: yoga, chi kung, meditation, massage therapy, 3 meals per day, walking tour and a gift. Rates for the spa package start at $2,222 for 3 nights. Hawaii Yoga Retreat starts at $1,431 single occupancy (or from $1,812 for two) for 3 nights and includes: meditation session, yoga, Pilates, breakfast, lunch, massage (body wrap or facial). Dinner is extra. All the food is organically grown.